Who are Verdantix - why would they write about kWIQly? ... an independent research and consulting firm with expertise in EH&S, energy and sustainability markets. Through our research and advisory services we help corporate managers, investors, technology executives and services firm leaders to make robust, fact-based decisions. We are committed to delivering objective, timely and accurate analysis to help our clients succeed. So why about kWIQly ? Having named kWIQly as one of nine "Most Exciting Energy Management Companies to Watch in 2015" (free with login) it made sense for them to dive a little deeper as they are all about "delivering objective, timely and accurate analysis". I won't expose detail as these are objective reports delivered for Verdantix clients, however the summary and contents page are public and "fair game". Note: Overall I am happy with the report but amazed how some fundamental objective opinions about a subject (and one I should know inside out) can challenge pre-conceptions. 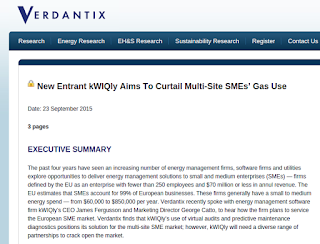 "Verdantix recently spoke with energy management software firm kWIQly’s CEO James Fergusson and Marketing Director George Catto, to hear how the firm plans to service the European SME market. Verdantix finds that kWIQly’s use of virtual audits and predictive maintenance diagnostics positions its solution for the multi-site SME market; however, kWIQly will need a diverse range of partnerships to crack open the market." It takes time to open any market with a transformative technology and the truly massive multi-site SME market represents a signature failure amongst energy management services and energy retailers. Possibly our biggest mistake was trying to do it ourselves! Fortunately the "diverse range of partnerships" that we are building addresses this (though why it took us so long to figure out what Verdantix saw immediately pains me - I first blogged about it only about a year ago - Conflicts on the Ground that serve no purpose ). Faced with only on-line energy monitoring portal , companies not primarily focussed on energy, see energy management as a necessary evil. They have neither the time nor skill-set to trawl through reams of data to figure out what matters. Service providers that want to differentiate themselves and support their client acquisition and retention models want to help out - so in turn we see a set of partners that need our help, are well-funded, and already have huge field sales forces that are delighted to offer something different. So they need to learn that giving energy viewing portals that show what you are doing (passively) and in hindsight is of very little value. Rather they should (and now can) pro-actively highlight what clients are doing wrong or more politically correct - identify their "opportunity for improvement". Then they can also support what needs to be done. This differentiates them from commodity sales channels. Finding opportunity for improvement and knowing what to do about it is pre-requisite to the job of any multi-site energy manager. I have written before that gas is tougher than electricity to meter and gas use is more complex (you generally see electricity in use but don't see heat, and gas is used before the heat can be distributed - so it is tougher to understand). But it is important to note that you cannot see electricity and gas use in isolation - a very common problem is where heating drives discomfort which is solved by electrically power cooling services. Waste correlates on each side of the coin and the correlation is a red flag ! 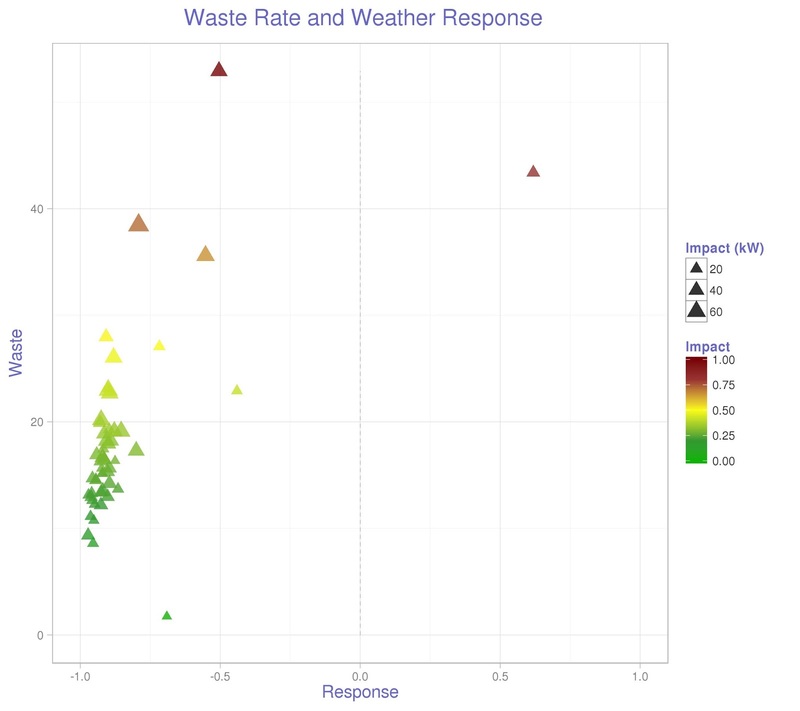 I would also point out that many of our current engagements are with the very opposite of SMEs - For example we have looked energy data from six European supermarket chains (and the existence of common unobserved causes of waste is quite remarkable). kWIQly’s Data-Driven Services Fills A Facilities Management Gap For Multi-Site SMEs. "So SME profitability sensitivity to energy pricing is disproportionately high at times of low economic activity. Also, when as an SME you are not busy, it is one of the few times when you might be motivated to shop around for a better overhead prices. So utility client life-time value (before churn) is in turn strongly influenced by economic growth!" It is not just the direct economics that are relevant to the energy service provider and their client - it is also the fact that whether it is your job say selling coffee on the high street or trading on wall-street - energy matters a) when you pay for it, b) when you aren't comfortable and c) when you are wrapped up in administering a thousand different supplier contracts. Energy companies (and FM) are ideally positioned to diversify horizontally - and this is seen in acquisition activity in the marketplace. Additional points of contact make for cross-sales, and better (more helpful) relationships with clients. This for us is the big one ! An energy retailer or an FM can benefit more by working with us than we can charge for the relationship. This is simply because they have more invested in differentiating product and service offerings than we do, they have less time to study technical niches where specialist suppliers are strong, and are necessarily conservative because overhead kills commodity businesses! In the next few weeks we will be announcing some partnerships that we have established (the ink is not quite dry on a significant one) and we would note that in the UK Energy retailers can now get our support indirectly through the recently launched AMR-DNA tool by Energy Assets plc. (I will be blogging about this separately). We are particularly interested in establishing partnerships in Holland and Italy at present (where the inherent value in AMR data has been taken seriously so metering roll-out progress s relatively strong - If this is you do get in contact info@kwiqly.com - and we will be in touch. How to save 1.5 Trillion Dollars - that's the question ! Do You care about Sustainability ? Swiss Army Knife, wrong tool for some jobs!